Lidl sponsors KKB Flower Bulb planting initiative. The KKB congratulate Lidl for their major sponsorship of our current Kilkenny City Flower bulb planting project with some 25,000 flower bulbs being planted throughout our City. A bulb for each of our citizens. these include Daffodils, Tulips, Iris, Anemone, Dahlias and Crocus. Elaine Bradshaw, Hon. 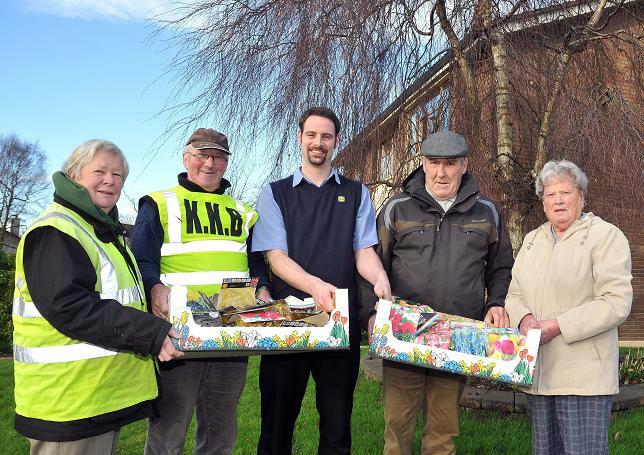 Secretary, Sean Leahy, Treasurer, Keep Kilkenny Beautiful; Darren Burke, Manager, Lidl, Waterford Road, Kilkenny handing over the bulbs to Mick Dooley and Brigid Brennan, Lacken Drive Residents Association. Picture: Michael Brophy. 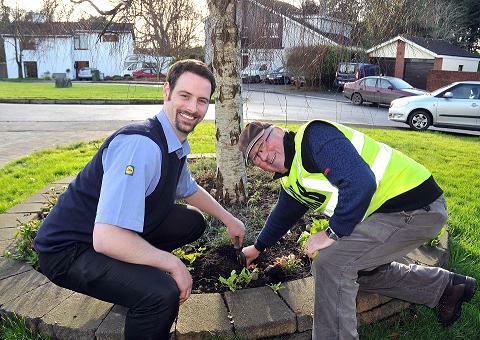 Darren Burke, Manager, Lidl, Waterford Road, Kilkenny and Sean Leahy, Treasurer, Keep Kilkenny Beautiful flower bulb planting. Picture: Michael Brophy. Keep Kilkenny Beautiful…………..because it is beautiful. This entry was posted in Biodiversity, Kilkenny City, Landscape, News and tagged Anemone, bulb, colour, Crocus, Daffodils, Dahlias, flower, Lacken, Lidl, sponsorship, Tulips by KKB. Bookmark the permalink.